Solar energy travels from the sun to the earth in the form of electromagnetic radiation. In this course properties of electromagnetic radiation will be discussed and basic calculations for electromagnetic radiation will be described. Several solar position parameters will be discussed along with means of calculating values for them. The major methods by which solar radiation is converted into other useable forms of energy will be discussed briefly. Extraterrestrial solar radiation (that striking the earth’s outer atmosphere) will be discussed and means of estimating its value at a given location and time will be presented. Finally there will be a presentation of how to obtain values for the average monthly rate of solar radiation striking the surface of a typical solar collector, at a specified location in the United States for a given month. Numerous examples are included to illustrate the calculations and data retrieval methods presented. 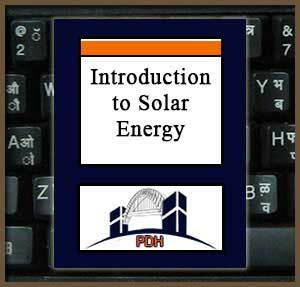 Know the major methods by which solar radiation is converted into other useable forms of energy. Be able to obtain an estimated value for monthly averaged extraterrestrial radiation on a horizontal surface for a specified month and latitude between 20 and 65 degrees.